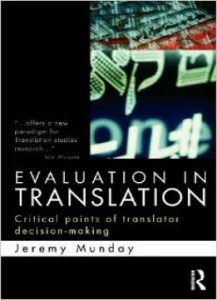 In this book, Jeremy Munday presents advances towards a general theory of evaluation in translator decision-making that will be of high importance to translator and interpreter training and to descriptive translation analysis. By ‘evaluation’ the author refers to how a translator’s subjective stance manifests itself linguistically in a text. In a world where translation and interpreting function as a prism through which opposing personal and political views enter a target culture, it is crucial to investigate how such views are processed and sometimes subjectively altered by the translator. To this end, the book focuses on the translation process (rather than the product) and strives to identify more precisely those points where the translator is most likely to express judgment or evaluation. The translations studied cover a range of languages (Arabic, Chinese, Dutch, French, German, Indonesian, Italian, Japanese, Russian, Spanish and American Sign Language) accompanied by English glosses to facilitate comprehension by readers. This is key reading for researchers and postgraduates studying translation theory within Translation and Interpreting Studies.